After the success of the Lego Star Wars franchise, and to a lesser extent, Lego Indiana Jones, developer Traveller's Tales has their try at another geek franchise... Batman. 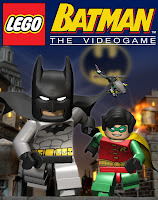 I really liked this game, and probably loved it compared to Lego Star Wars, which is likely because I'm more of a Batman geek than a Star Wars. From the moment that the game opened up with Danny Elfman's legendary score from Tim Burton's Batman, I was instantly in love. Unlike with Lego Star Wars and Indy, uses an original storyline rather than following the stories from the movies, the formula the other games have used. They are simple plots involving robbing banks, trying to take over the city... you know, your run-of-the-mill villain affair. Okay, so the stories are nothing spectacular, but at least they're original. What makes it more interesting is that in addition to playing the main hero storyline involving Batman and Robin, you're also able to play missions involving the villains. So for every one story, you get the perspectives of the heroes and villains. This is in addition to the Free Play mode which allows you to enter any previously completed level with any character. The game play is exactly as the same as the afforementioned games, but they did tweak some of the controls for a more smoother play. For me, notably, they've made the controls while in vehicles less cumbersome. Fighting also seems quicker than in Star Wars, where your characters perform combos after mashing the attack button quickly in succession (opposed to in SW where your character swings his light sabre twice in a row). The characters are also a bit more defined in this game, with each of the main heroes and villains having their own unique abilities. However, some of the annoyances from the previous games still exist in this one. Most notably is the static camera which when having to do platform to platform jumps, reduces the whole thing into a trial and error process. Much like the other Lego games, there is tons of replayability, with lots of hidden treasures, secrets, and such that you'll have to obtain by using different combinations of characters. Much like Lego Starwars, the score in Lego Batman is outstanding, with more of the influence from Burton's movies than Schumacher's or Nolan's. So in the end, this is a fun game, and I'd have to recommend it if you want an easy and enjoyable game to play with kids. Later geeks. I've never played any of te Lego games. I really should. I love the lego games, they are so much fun. I suppose I am a bit biased seeing as though I still have some legos (Millennium Falcon collectors edition, hell yeah! ), but yeah the games are really enjoyable! Honestly, I recommend this game if you're gonna try a Lego game. Don't expect anything astonishingly difficult, but rather cutesy and fun.